I finally got all my sketch-notes from the Graphic Medicine conference scanned and assembled into a pdf. Yah! I even put it onto my Bumblebat shop on Etsy - so go ahead and buy a copy (It's only $3.50). Download it, print it out - and get some good ideas and inspiration. If you'd like to see the pages I drew as well as some from the other sketch-noters, they are published on the Graphic Medicine page on the Center for Cartoon Studies website. 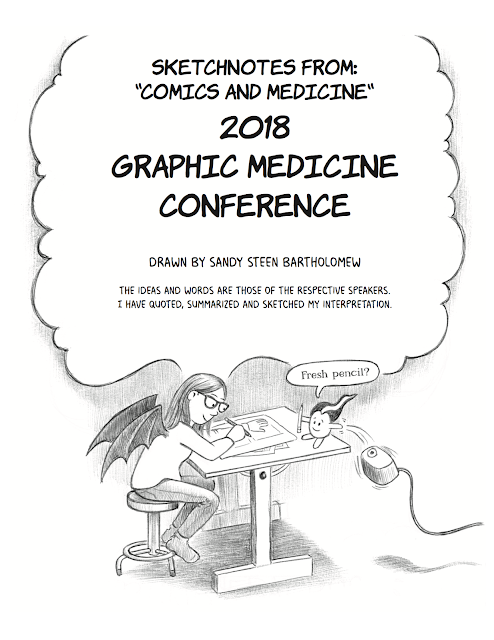 More about the Graphic Medicine Conference can be found HERE. If you'd like to hire me to sketch at your conference - I'd LOVE to help you out. I can also work from video or turn your TEDtalk into a lovely page of images and info. Did the “ tribe” of squirrels do some harvesting for you? Your work is amazing, so proud of you. Fresh meatballs, baked cookies and Johnnie Walker Blue Label tasting. Any takers?